July 2, 1863 marked one of the watershed days in American history. Robert E. Lee designed a plan to attack both Union flanks, the left around the Round Tops and the right at Culp's Hill. It was a day full of dramatic fighting that saw the Union hold the line. It would take its place as one of the deadliest days in American military history. Everyday places like John Rose's Wheatfield, Little Round Top, Devil's Den, Culp's Hill, and Sherfy's Peach Orchard gained everlasting fame. For a photographer, this is the part of the battlefield that deserves the most attention. It offers eye-catching scenery and great views of the battlefield. Go first thing in the morning, and you will be mostly alone as you watch the light of magic hour spread over the grounds around you. 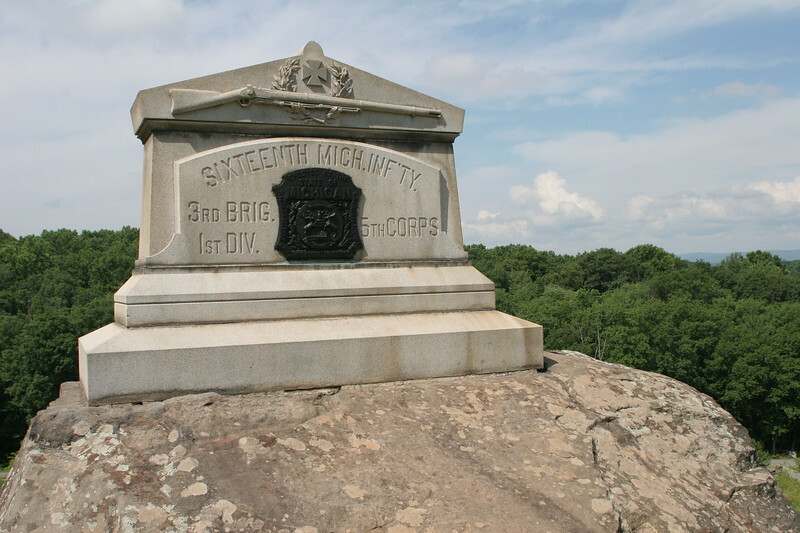 Monument to the 16th Michigan on Little Round Top.